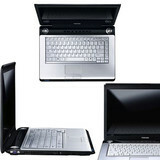 The Toshiba A200-180 is more of a desktop replacement PC than a slim portable laptop that can be whisked from location to location. Its considerable bulk means you won't want to carry it for long distances, while its battery life is limited. The Toshiba Satellite A200-180 lasted for just 78 minutes in our intensive tests. There are, however, some nice features to compensate. With its 1.86GHz processor, the Toshiba Satellite A200-180 is reasonably powerful and, with the help of 1GB of DDR RAM, scored an acceptable 62 points in our WorldBench speed benchmark. You also get a nice range of connectivity options (802.11a, b and g Wi-Fi are all supported), while the 6-in-1 card reader and quartet of USB ports are extremely useful. In contrast to the Toshiba Satellite A100 we reviewed recently, a 1.3Mp camera is included, although there's still no Bluetooth. And, more surprising in light of the emphasis on multimedia, no TV tuner. T2350: » Weitere Infos gibt es in unserem Prozessorvergleich Vergleich mobiler Prozessoren und der Prozessoren Benchmarkliste .